Vijay Sethupathi First Look Motion Teaser as Raja Paandi From SyeRaa Narasimha Reddy on Konidela Production Company. 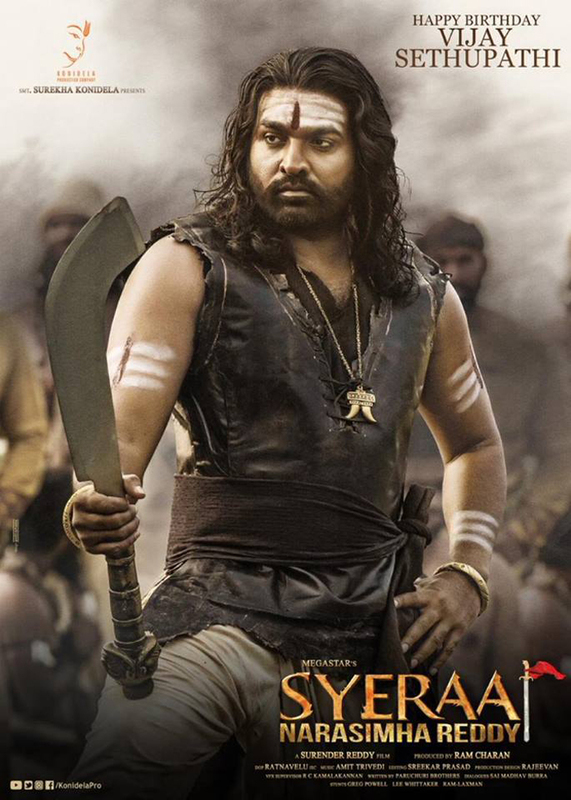 SyeRaa Narasimha Reddy 2019 Telugu Movie ft. Megastar Chiranjeevi, Megastar Amitabh Bachchan, Vijay Sethupathi, Nayanthara, Jagapathi Babu, Tamannaah, Kichcha Sudeep, and Brahmaji among others. The SyeRaa Narasimha Reddy is being Directed by Surender Reddy. SyeRaa Narasimha Reddy Film Produced by Ram Charan under Konidela Production Company. The SyeRaa Narasimha Reddy Songs and Background Music composed by Amit Trivedi. On the eve of Vijay Sethupathi birthday 2019, the makers released the Vijay Sethupathi First Look Motion Teaser Poster who plays Raaja Paandi in the film. Vijay Sethupathi looks fearless essaying a never seen look in the film. Vijay Sethupathi Wearing his devotional look and yet carrying that warrior like guts, This will no doubt come as a big delight for Vijay Sethupathi fans, who have been waiting to witness his first look officially get released for a while now. The Team Sye Raa Narasimha Reddy wishes our Raaja Paandi a very Happy Birthday. Megastar Chiranjeevi’s SyeRaa Narasimha Reddy Full movie is releasing in 4 languages: Telugu, Tamil, Kannada, and Malayalam.